When you do a lot of your own car repair, maintenance, or restoration, there’s nothing more helpful than investing in a good car lift. 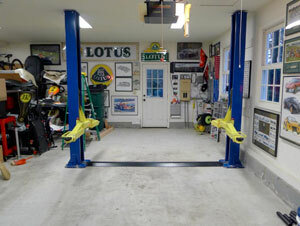 Unfortunately, most of the automotive lift reviews out there only cover commercial lifts so deciding on the best car lift for your home garage can be a challenge. 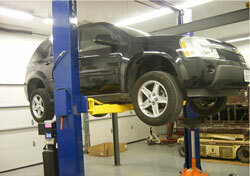 Below you’ll find vehicle lifts including 2-post, 4-post, and scissor lift varieties. They all have their own advantages and disadvantages including cost, lift height, weight capacity, versatility, and even portability. This might very well be the best two post lift out there for home garages. The 111 inch height allows you to fit this unit under a low ceiling, while the 106 inch clearance between posts is perfect for a wide range of vehicles. The 3-stage arms can lift up to 9,000 pounds in approximately 40 seconds to a height of 72 inches. The arms are completely adjustable so you can work on your Ford F150, BMW M3, John Deere riding lawnmower, or even a golf cart. Installation is easy and relatively quick for a stationary lift. Expect a few hours with the help of a friend and Youtube instruction video such as the one below. In the rare event of a problem, customer service has been quick to handle the situation, and were able to give owners additional tips to help them adjust their lift. Perhaps the largest complaint with this unit is the shipping requirements. 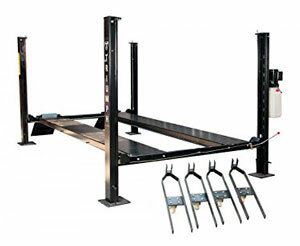 When shipping to a residential garage, buyers are required to unload and install the 1,300 pound lift themselves. A related sticking point (as noted above) is that the lift often doesn’t come with its instructions, so you will need to refer to YouTube or other sources once you manage to get it into the garage for assembly. 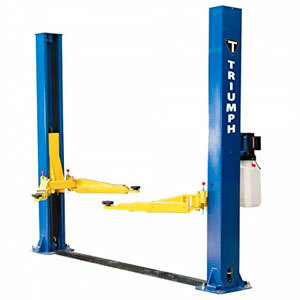 But for a heavy duty two post lift that will lift just about any vehicle, there’s no wonder why the Triumph NT-9 is such a popular lift for both professional and home mechanics alike. For the money, this one is hard to beat. The QuickJack may be small, but that doesn’t stop it from beating out the big boys. Compact enough to store in your car trunk and take to the track or a buddy’s garage, the two jack frames are lightweight and durable, making it easy to set up shop wherever you are. Lifting takes moments and is performed by remote control. Once the work is done, a quick release bar allows the car to descend smoothly and everything breaks down quickly. Rated for 5,000 pounds, this might just be the best home car lift for the money. Having a portable lift that can give approximately 22 inches of clearance is a welcome treat for owners of the QuickJack. They report the first assembly may take a while, but becomes quite fast once you’ve done it a few times. It’s hard to find an issue with the QuickJack. Some minor setting up is required, but the process is straightforward. A few have commented that the illustrations for the instruction manual are a little dark, but not impossible to follow. Perhaps the best 4 post lift currently on the market, the NSS-8 can be the perfect answer to limited garage space. Its 8,000 pound weight limit means you can raise one car and park another underneath. Drip trays help ensure no fluids leak onto the lower vehicle. Of course, the lift can also be used for maintenance work and even be wheeled around (similar to tire skates) using the included castor kit. Ten automatic locking positions ensure the raised vehicle stays elevated until you decide otherwise. Owners of this lift will warn you that 30 amps is necessary but it plugs into a normal 110v outlet. The power means a smooth, quiet ride up for your car. The castors are also highly touted, as they allow the NSS-8’s hefty (1,600 pounds on delivery) frame to be moved with ease. Thanks to the locking mechanism and sheer strength of this lift, users have stored their elevated vehicles for long periods without any problems. While the stability of a 4-post lift can’t be beat, the disadvantage is that you won’t be able to work on anything wheel/brake related like you would a 2-post lift. The biggest sticking point with the NSS-8 is documentation – or the lack thereof. As with the NT-9 above, the NSS-8 seems frequently to arrive without instructions. Some digging around online will help with this problem, although the extra work shouldn’t be necessary. You will also have to unload the truck yourself, so be ready for the hefty load. We just couldn’t complete this list without including the MaxJax. This 2-post lift breaks all the rules by being portable and compact – without sacrificing safety. The 6,000 capacity kit is the perfect car lift for small garages, requiring a minimum ceiling height of only 8 feet. Add to this the more open workspace that scissor jacks can’t provide, as well as the ability to collapse and store when not in use, and you have one of the most amazing pieces of home mechanical equipment out there! Owners will be quick to tell you how easy this lift is to both use and move. It’s perfect for maintenance work and detailing, although the lower ceiling requirement does mean the max lift height is also a bit lower. There’s a bit of preparation to make sure the lift can be mounted securely, but once this is done, the MaxJax is extremely sturdy and safe. Dannmar’s customer service is something of an industry legend, but not in a good sense. The outsourced representatives are poorly educated about their products, and will often overcharge to ship replacement parts. As for the lift itself, the only real issue is that the O-rings have been known to leak for some people, so they should be checked regularly. Since the lift uses two cylinders, it’s normal for there to be a little lag on one side, although this might worry anyone not expecting it. This 6,000 pound capacity lift is designed to fit into narrow bays and rests on solid steel castors to give it some mobility. Using the multi-position safety lock and adjustable arm assemblies, it’s easy to get your car in the optimal position. The maximum height for this lift is 36 inches (39 if you add lift blocks). Owners have a lot of positive things to say about this lift. It’s sturdy, well-built, and the locks are easily disengaged by raising the car slightly, as opposed to the manual methods of other scissor lifts. Users also note that you can store a car on the raised lift so long as the locks are engaged. Shifting this lift is a lot more difficult than many other models, especially if you have a textured or uneven floor surface. The power unit is designed to also serve as a hand truck, although this has little effect on the mobility and might cause more harm than good. 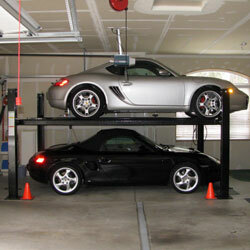 Deciding whether or not a garage lift is a good fit for your garage is a big decision to make. You need to keep in mind that there are different types and sizes available, and install the one that best suits your purposes. If you do as much of your own automotive work as possible, a car lift may be good idea, but getting the wrong one could mean that you’re never able to realize the full potential of what this tool can do. If the only work you do on your car is washing and detailing it every now and then, you may not need the expense and installation of a car lift. 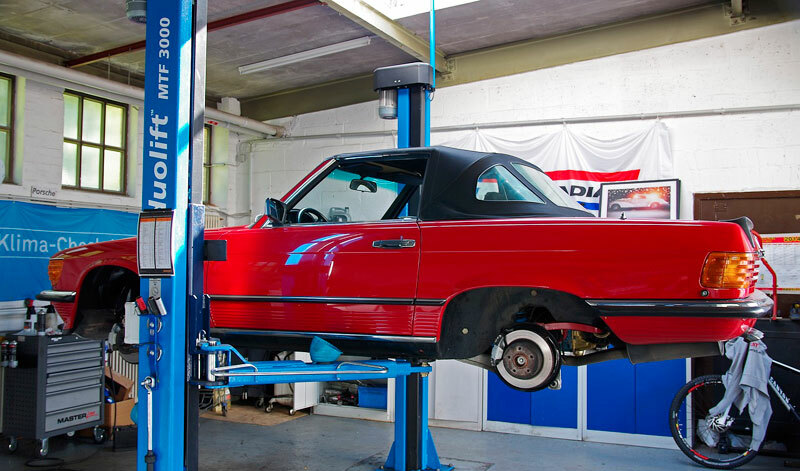 If you perform repairs such as oil changes, swapping out the alternator or starter and other light to medium jobs, a car lift could save you a lot of time and money in automotive repair costs. If you perform serious auto work, you’ll quickly begin to wonder how you were ever able to do without one. 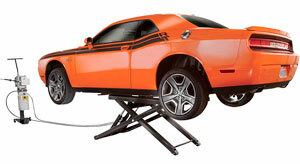 The idea behind a vehicle lift is to assist you in lifting the entire vehicle up at one time. 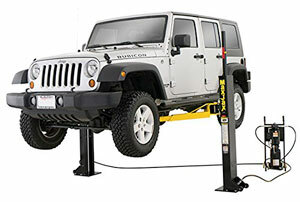 This provides you with a faster and more convenient method than the use of a floor jack and stands, and will get your vehicle up high enough to perform many types of repairs. By contrast, using ordinary car ramps will only lift one side or one end at a time, forcing you to remove the car from the ramps and reposition them before moving on to the other side or end of the vehicle. Car ramps are fine for a quick oil change or when you don’t need a lot of clearance to work. While jack stands and car ramps are generally very safe when used correctly, car lifts have a much lower possibility of user error which could result in injury or worse. Another benefit is that a vehicle lift allows you to collect all of the necessary tools so that they’re conveniently available and placed exactly where you can reach the ones you need. Have a bad back? Nothing beats having a garage lift. Installing a lift that is poorly made or manufactured for the wrong size vehicle introduces risks to you and your vehicle. It’s always a good idea to invest a little more for a top-rated product than to trust your life to a machine of questionable origins. Similarly, it is not a good idea to scrimp on the weight rating of the lift. You will fare much better to buy a lift that is rated for heavier vehicles than to install one that cannot safely lift and hold the car you drive. A scissors lift, or one that has four “wings” which can be adjusted to fit the width and length of your vehicle, is often the least expensive type of garage car lift to buy and quite popular for the home garage. Since it can be adjusted for different vehicles, you eliminate some of the concerns over vehicle size and safety. Additionally, a scissors type lift provides lifting action to the vehicle frame, which means you can use it to more easily rotate tires, change brakes or other servicing that requires you to access all four wheels. When not in use, the lift retracts into a low profile so can can park directly over it. The biggest disadvantage is that you can not work directly underneath the vehicle where the lift is. 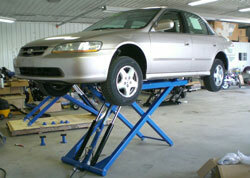 More common in small mechanic shops, two-post car lifts are also seen in many garages of amateur mechanics. They’re made up of two heavy duty posts (one on each side of the car) with a supportive stabilization arm on each side. The combination can easily lift and hold a lot of weight. With a small footprint, they will fit in a variety of garages and allow easy access to all wheels and underneath the vehicle. Two-post lifts are recommended if they’ll be getting a lot of use throughout the day. Four-post lifts offer a lot of advantages over other types of lifts but at a higher cost. You’ll typically find these at those quick lube oil change places or shops that work on exhaust systems but more and more of these are seen in home garages these days. With four heavy duty posts, they can lift and hold the heaviest of vehicles. Using one is as simply as driving on it and raising the lift. One of the biggest benefits is the fact that a second vehicle can often be stored directly underneath the lifted vehicle so it is ideal for small garages. The biggest drawback is that you aren’t able to do any work with the wheels since they are in contact with the lift. You should also be aware that lift manufacturers generally have disclaimers which absolve them of any obligation if the lift is not installed exactly as intended. For your own protection, it is better to hire an established contractor who is experienced in lift installations, and make sure that you have a warranty in writing in case the unthinkable happens.